Running in Paris – the scenery is great, the parks are plentiful, and the bakeries are on every corner giving you just one more reason to go that extra kilometer (“If I run a bit more, I can get two croissants…”). But running in Paris can also get lonely and, sadly, monotonous. Listen -- it's time to change that! Fortunately one French start-up called Jogg.in is making change happen. The guys behind it are launching an online platform that allows users to find other people in your area to jog with and to run with a purpose, ideally to raise money for a cause. The London marathon raised nearly 53 million pounds for charity in 2012 while Paris’s raised nearly 52 thousands euros. We can do better than that...Jogg.in will be able to help! 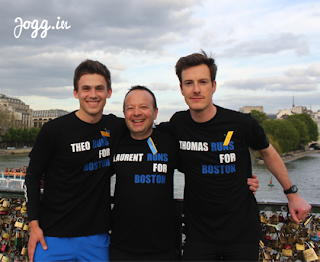 I met the Jogg.in team during our #BostonStrongParis 5k after April’s tragic bombings at the Boston Marathon. They were extremely excited to see a group of such dedicated runners coming together around an important cause, which embodied the spirit of their concept. Now, the team, including Théo Thomas, and Laurent, need a little boost to bring their idea to the starting line. They are raising money on a crowd funding site called KissKissBankBank. They are almost halfway to their goal so that they can make their concept a reality and go on to raise more money for more worthwhile causes. In order to help them out, I’m offering up an incentive to those who donate 50 euros to the cause – free running tours of Paris!!! I’ll be training for the Paris (or maybe London) marathon anyway, including sessions with the Jogg.in guys, so it’d be great fun to have locals or tourists come along with me and discover a bit of Paris history on the way. What better way to see Paris and eat croissants guilelessly while on vacation??? It’s also the perfect way to embrace the concept behind Jogg.in and to meet other local Parisian runners in the community. Dates will be organized once the campaign has finished, but if you're a visiting Paris and you have specific dates, just let me know ASAP and we can totally be work it out! For those living here, we’ll try to do most tours before it gets too cold! So don’t hesitate to sign up and donate so that this innovative project can get the strongest possible start. >>So click here to check out their project<< and go ahead and donate. If you give more than 100 euros, you can still be eligible for the tour, no worries! If you have any questions or concerns about the running tour, don’t hesitate to ask in the comments section. Hope to see you soon with your trainers laced up and ready to go!